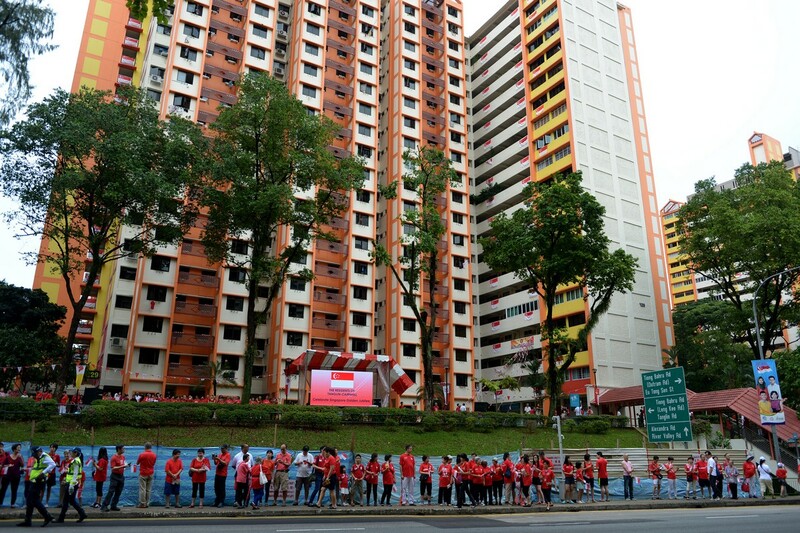 Over at Mountbatten Community Club, (above) residents and grassroots leaders had a singalong at the National Day Observance ceremony. 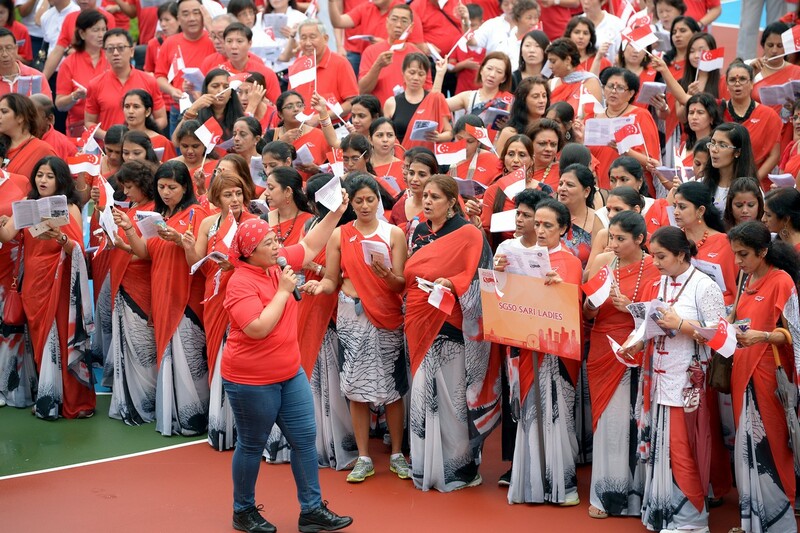 The Marina Barrage was a sea of red yesterday, as Singaporeans donned red outfits and came out in force to catch the action up close. They were in the barrage area in the morning for the daredevil aerobatics of the Black Knights, and they were there in the evening for the fireworks extravaganza. 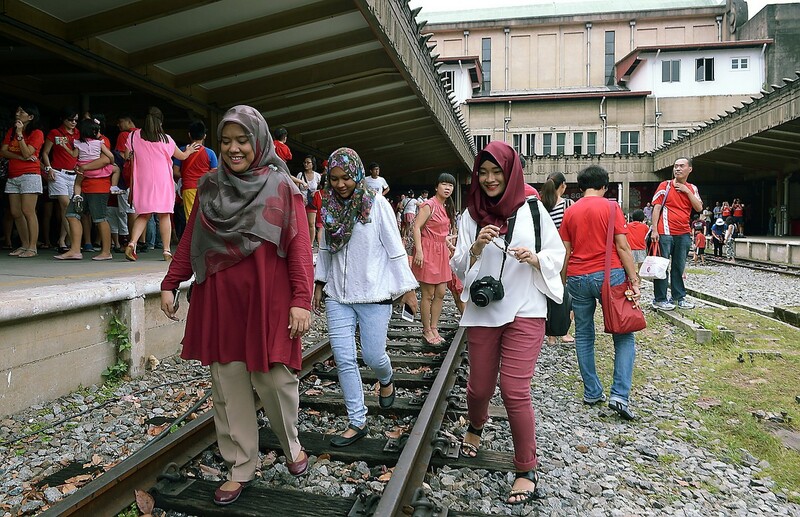 "It was a last-minute decision, but we quickly did our research and thought we should take our children here," said teacher Noor Aidil, 39, who was at the barrage with his wife and two sons, aged six and three. 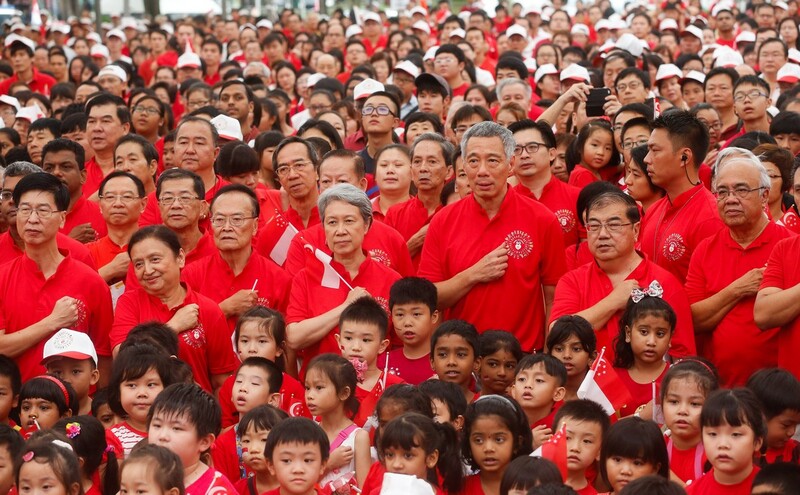 "It's been a wonderful 50 years of rapid development. 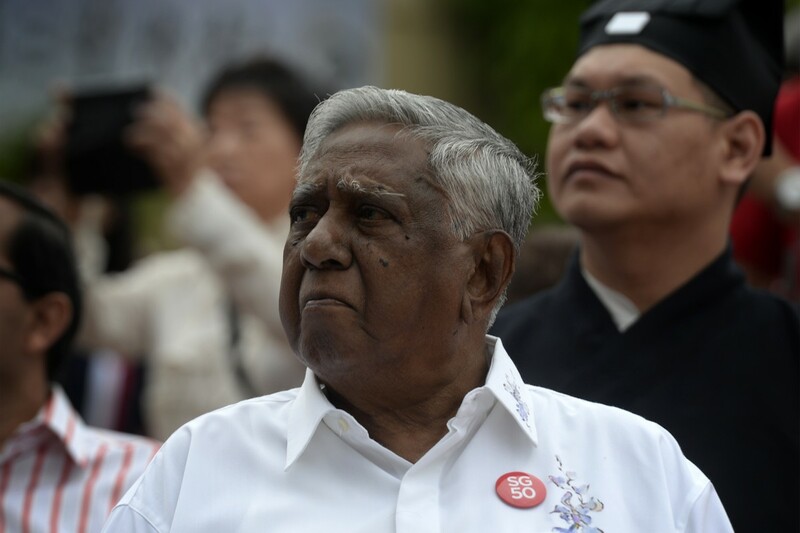 Let's hope for 50 more," he said. 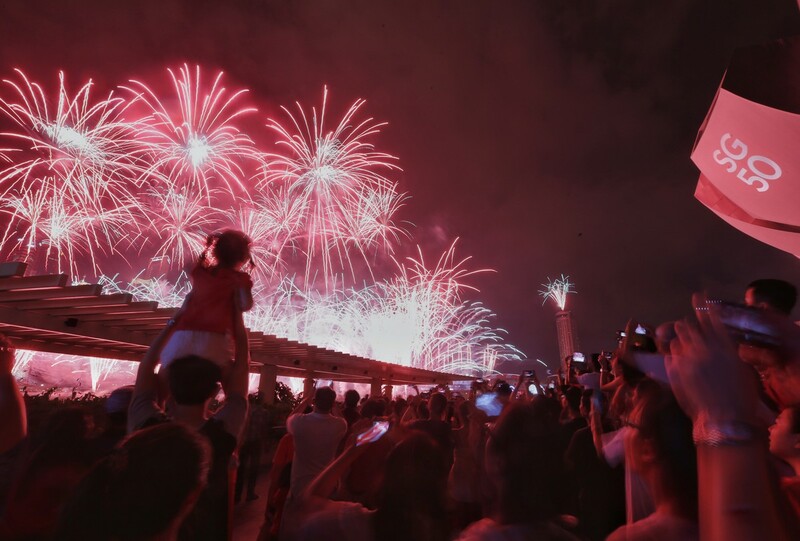 About 67,000 people visited the Marina Barrage yesterday, according to estimates by the Public Utilities Board. And in the afternoon, it was standing-room-only on the facility's Green Roof. Many families got there early to lay out picnic mats, fly kites and spend the Golden Jubilee afternoon lounging away. It was a major family outing for some. The Lins, for instance, were out on the Green Roof - all 26 of them from across four generations. 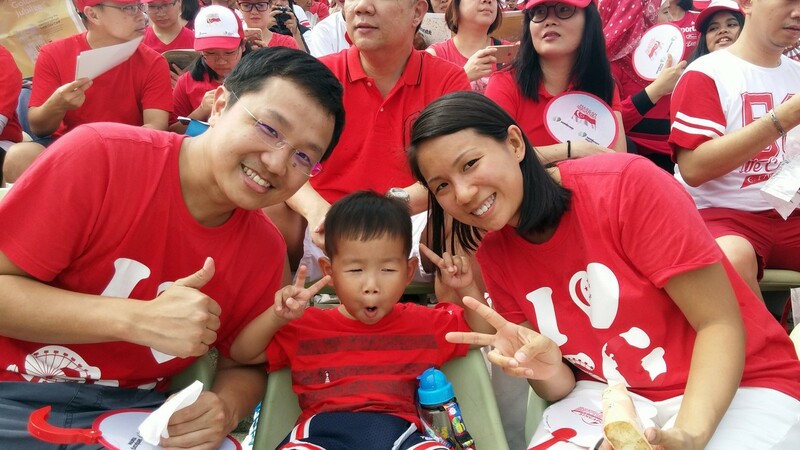 They were all dressed in a white "family T-shirt" specially designed for the occasion. "Every year, we wear a different shirt. We feel this really unites our family," said hairstylist Jason Lin, 43, adding that this year is the family's third on the Green Roof. 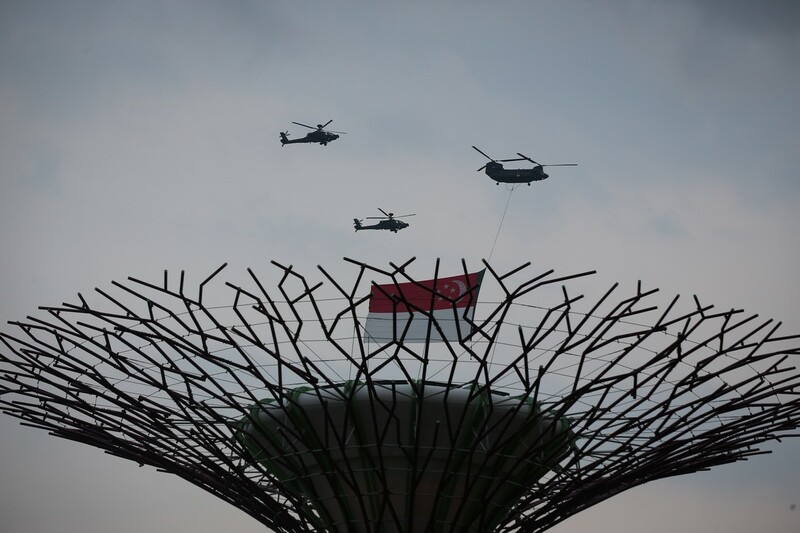 Later in the evening, the crowd whooped, cheered and went wild as RSAF aircraft thundered above them once more. 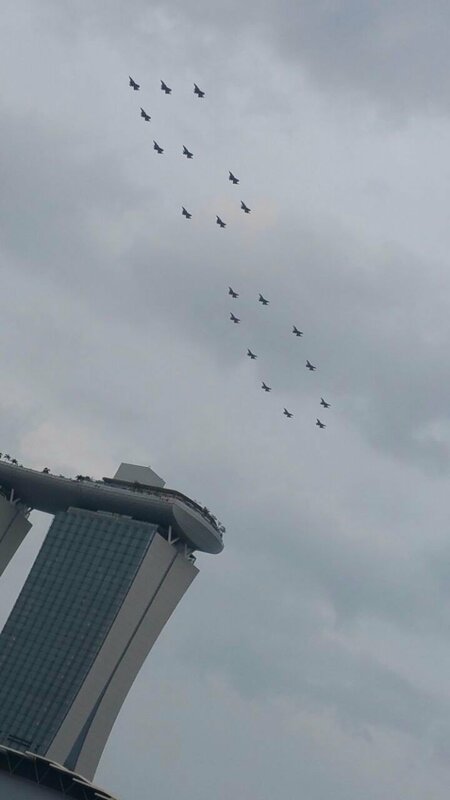 "Every time I see the flypast - I can't describe it, but this sense of pride just wells up inside me," said project manager Michael Tong, 51, who was there with his teenage daughter and wife. 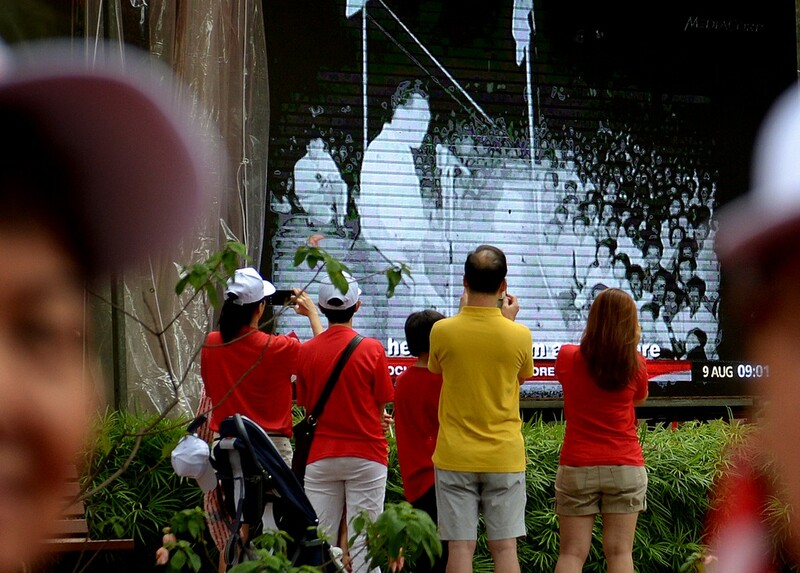 Over at the Botanic Gardens, Singaporeans started streaming in from 7am to join in the festivities. 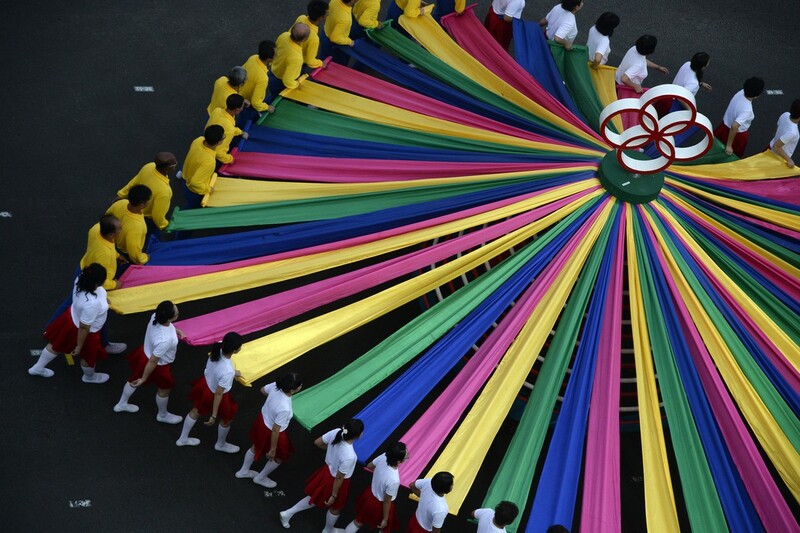 Many spent the day visiting carnival booths, where they could get their faces painted, munch on traditional snacks and try out childhood games such as five stones. Trade executive Vijaya Barathi, 30, took her two children, aged nine and six, for a picnic on the lawn near the Shaw Foundation Symphony Stage. "In the future, when there is an SG100, they can share memories of this special day with their own children," she said. 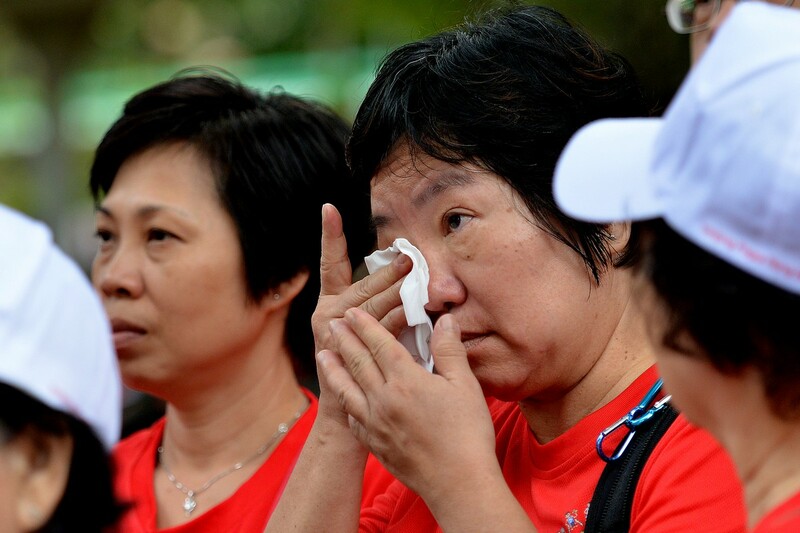 Housewife Sandra Wong, 42, was at the Gardens as well, with her two daughters. 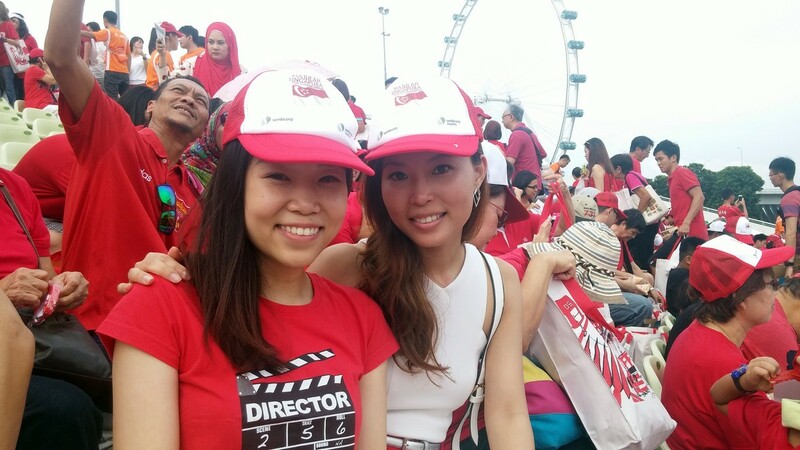 "I feel happy to call Singapore my home, and I want to teach my two girls to be grateful for how far we have come," she said. "I want my girls to carry these values into the future, and contribute meaningfully to our country." 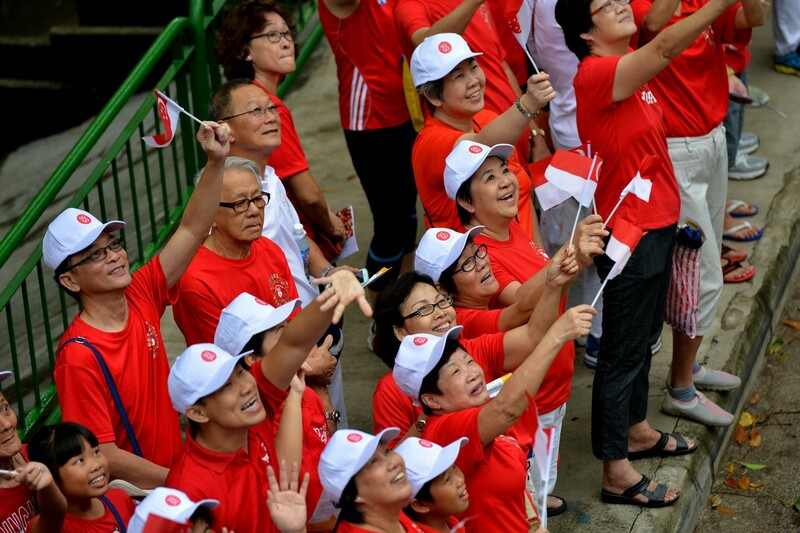 Meanwhile, spirits were high in the heartland too, as many gathered to watch a live screening of the National Day Parade. 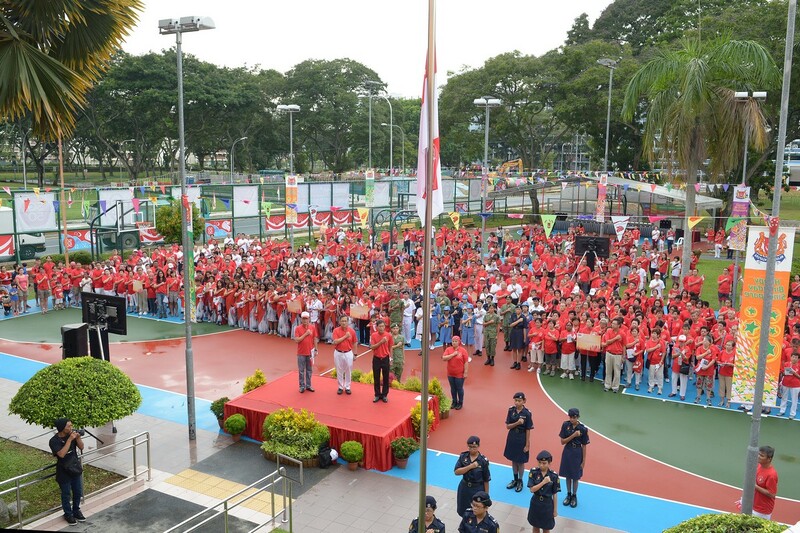 At Serangoon Community Park, more than 200 residents sang along to National Day songs, waving Singapore flags enthusiastically. 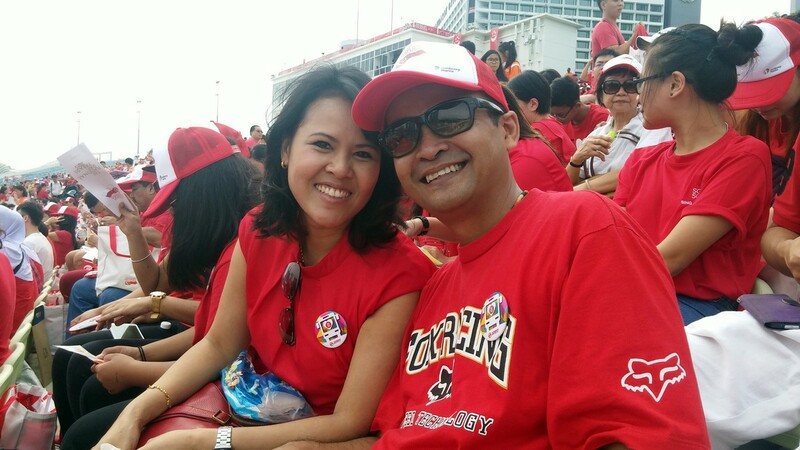 Programme manager Phua Soo Ngern, 48, was there with her husband Liew Kok Seng, 50. She said: "I came here for the atmosphere. 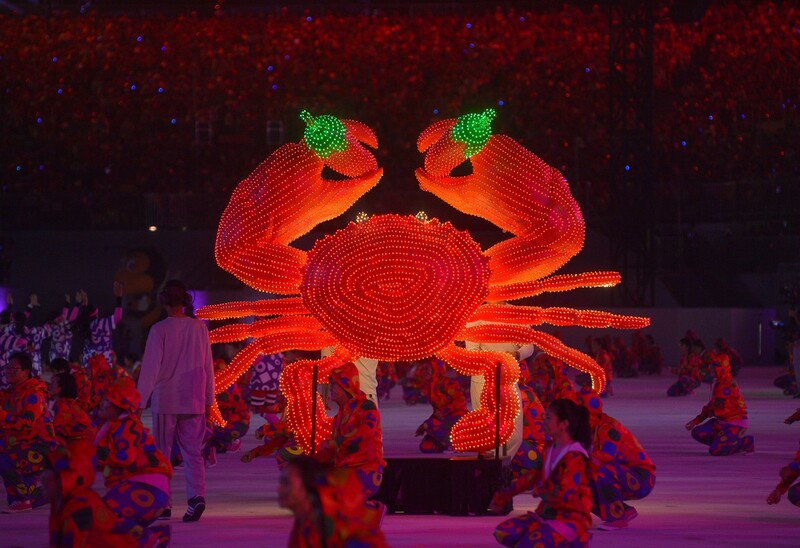 I thought the parade was excellent." 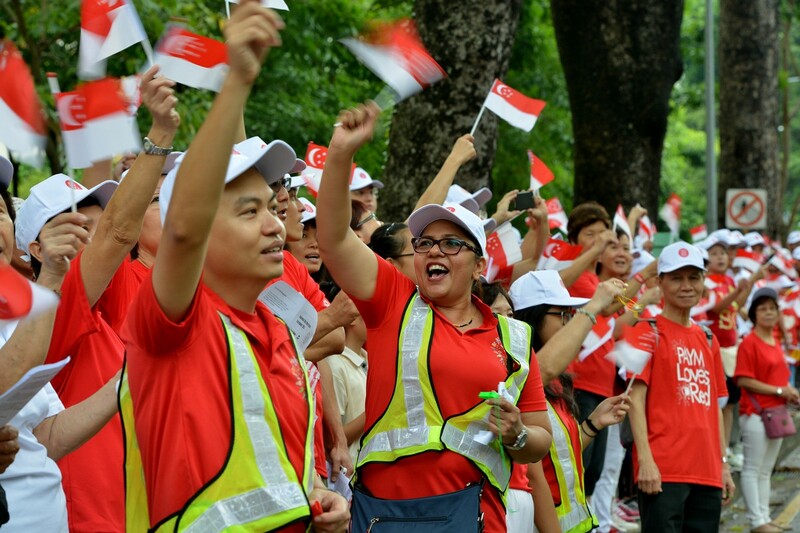 Despite early morning rain, Singaporeans marked National Day with observance ceremonies and colourful celebrations all around the island. 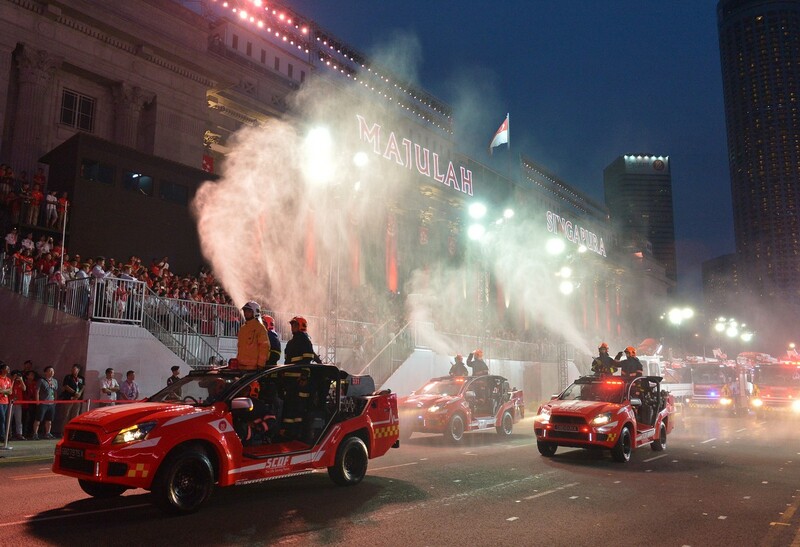 The celebrations kicked off Sunday morning when sirens blared at 9.00am. 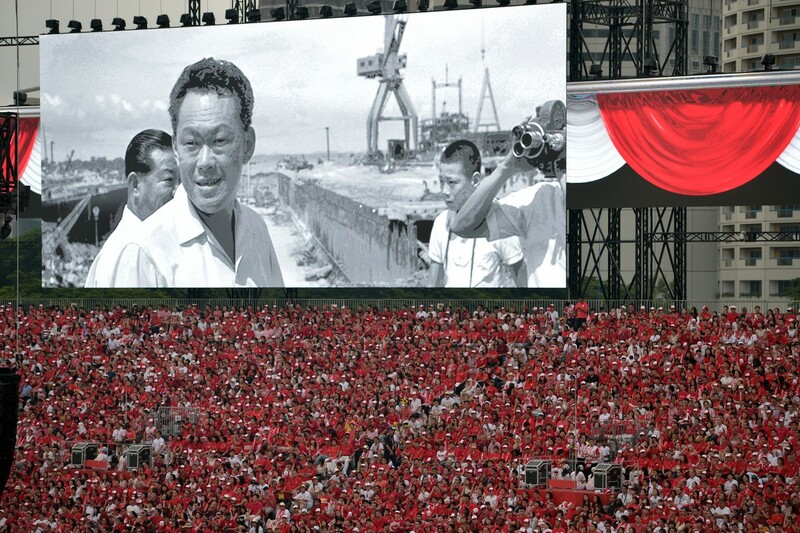 National TV and radio stations broadcast a 2012 recording of Lee Kuan Yew re-reading the original declaration of independence. 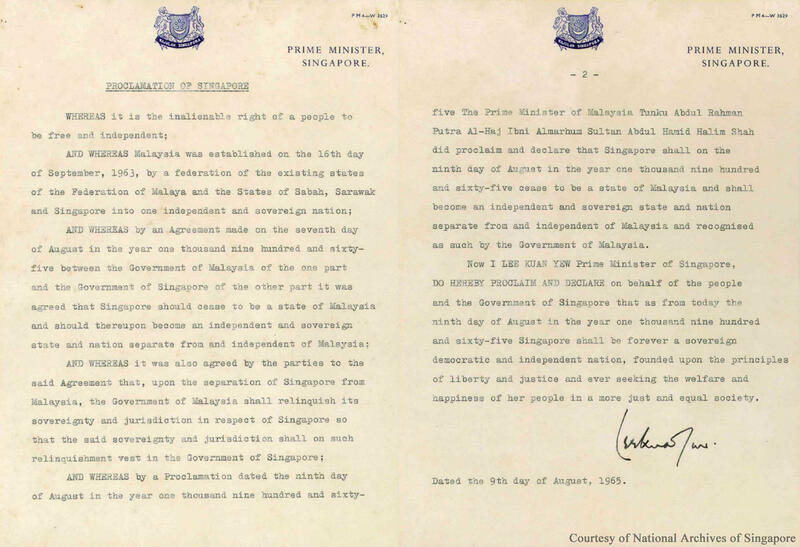 Singapore became a republic on August 9, 1965, when it was ejected from the Malaysian federation following a stormy two-year union. 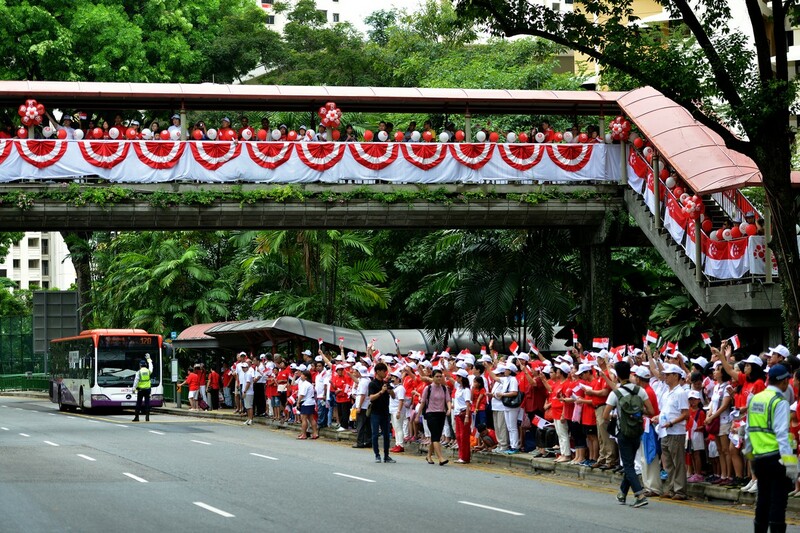 Residents line the street along Lower Delta Road to witness the live broadcast of the late Mr Lee Kuan Yew reading the Proclamation of Singapore. 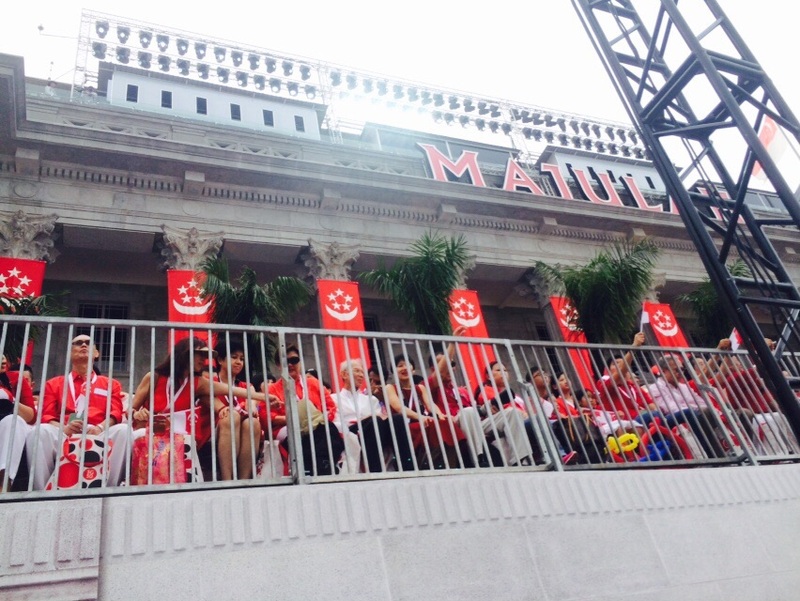 Marine Parade residents during the proclamation moment at the National Day Observance Ceremony at Marine Parade Terrace. 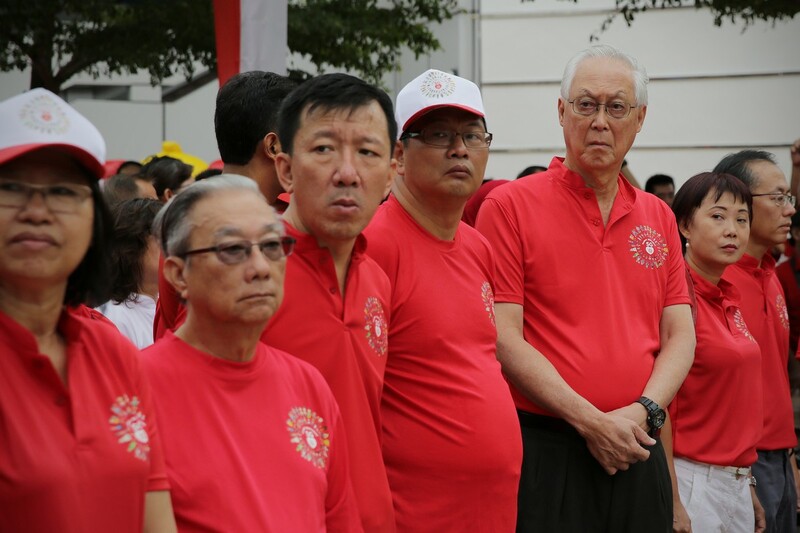 Emeritus Senior Minister Goh Chok Tong at the National Day Observance Ceremony at Marine Parade. 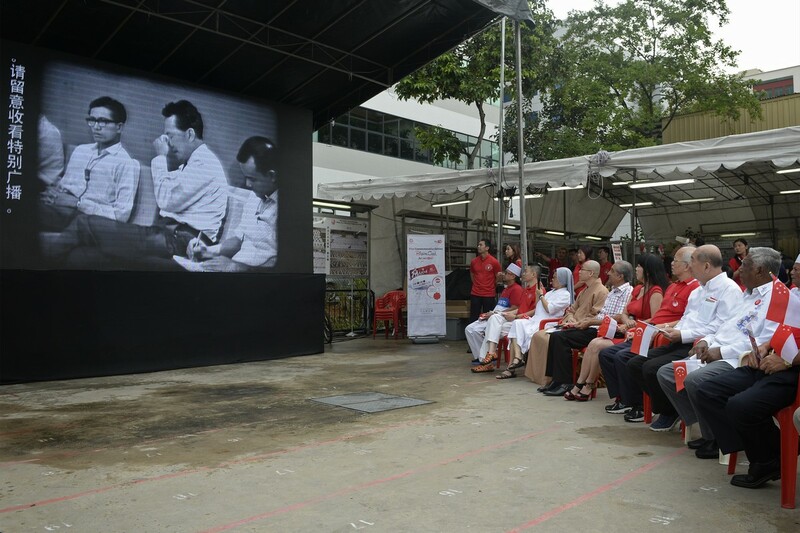 Former president SR Nathan, flanked by representatives of the 10 religious groups in Singapore, watch a video of the late Mr Lee Kuan Yew during the proclamation moment during the Interfaith National Day Observance at the Lorong Koo Chye Sheng Hong Temple. 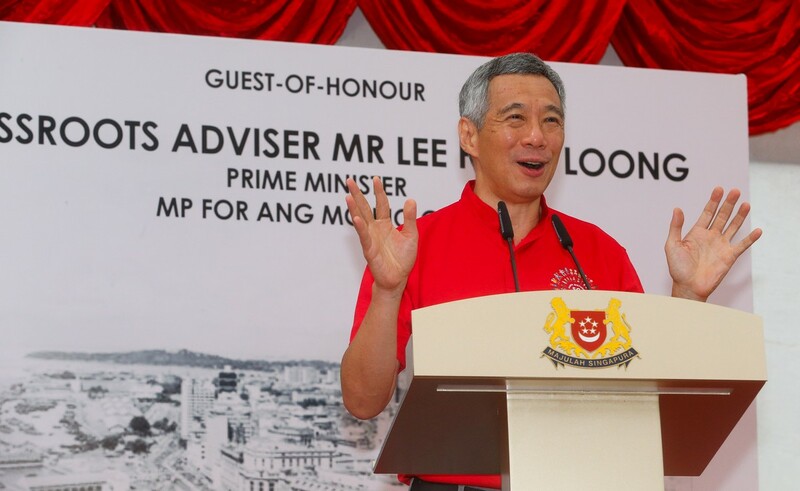 At Teck Ghee in Ang Mo Kio, the ward of Prime Minister Lee Hsien Loong, flag-waving crowds also gathered, among them pupils of Townsville Primary School. 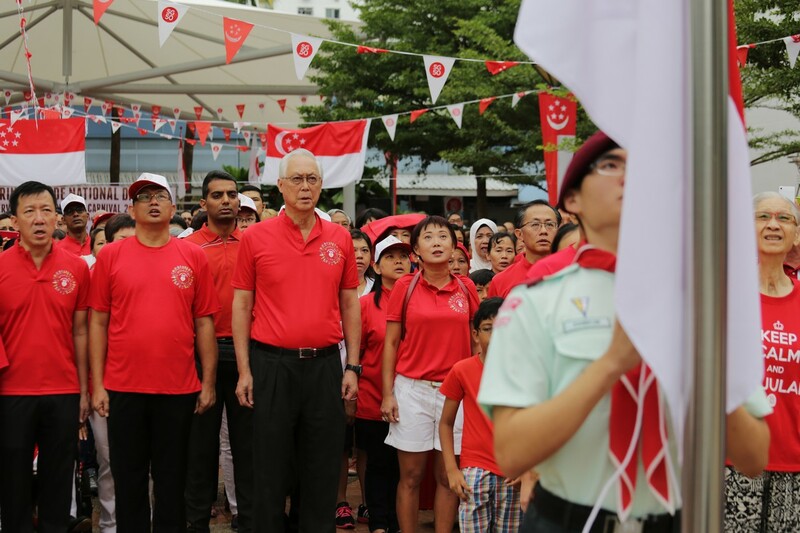 Mr Lee joined the residents for the Proclamation moment, and later, for a birthday song and the cutting of an SG50. 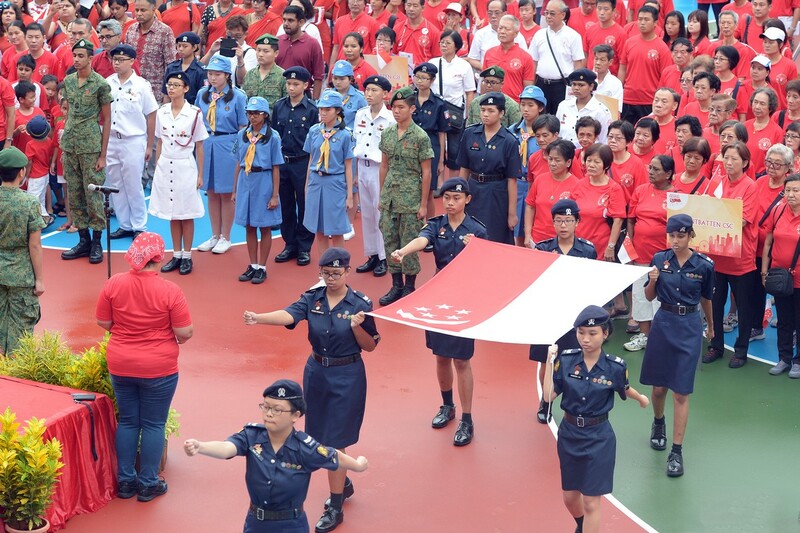 Students from Tanjong Katong Girls School carried the state flag at the National Day Observance at Mountbatten Community Club. 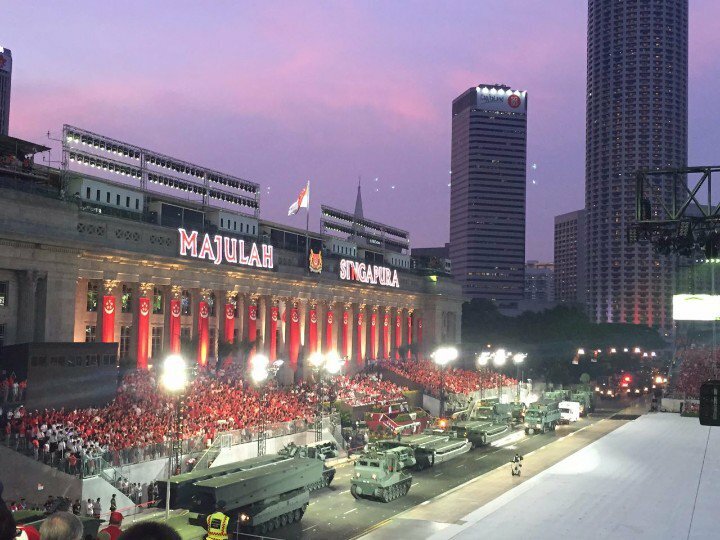 Singapore will mark 50 years since independence on Sunday with nationwide celebrations including a huge military parade and firework display. Residents looking at old items and photographs at the launch of the 'Memories of Mountbatten', a photo exhibition depicting the history of the Mountbatten estate. 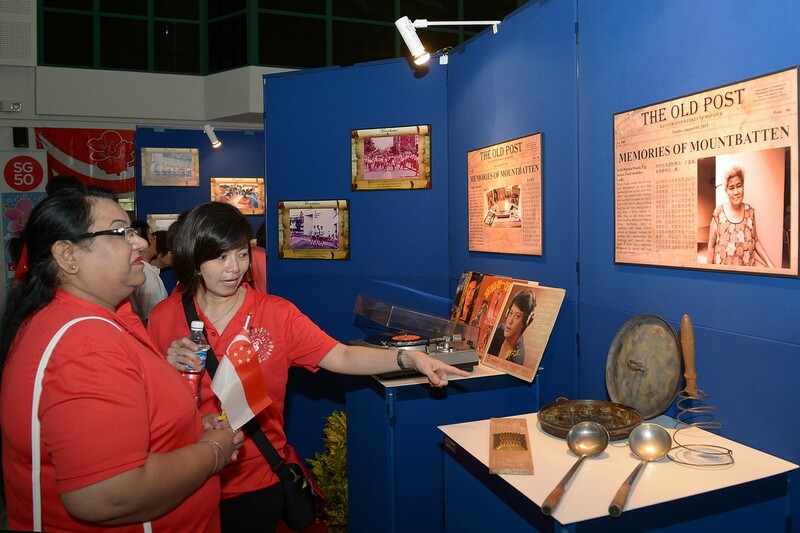 The exhibition was launched by Mountbatten MP Lim Biow Chuan. 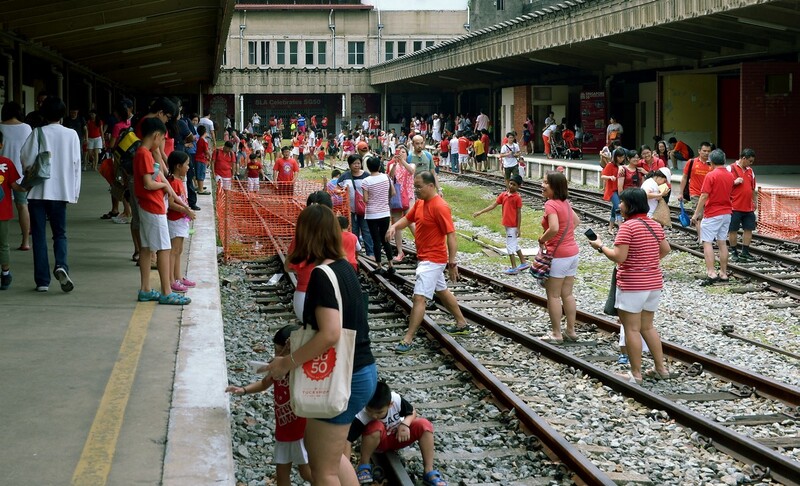 Ms Kamaliah Mohtar with her two kids play 'Capteh' at the former Tanjong Pagar Railway station SLA SG50's carnival. 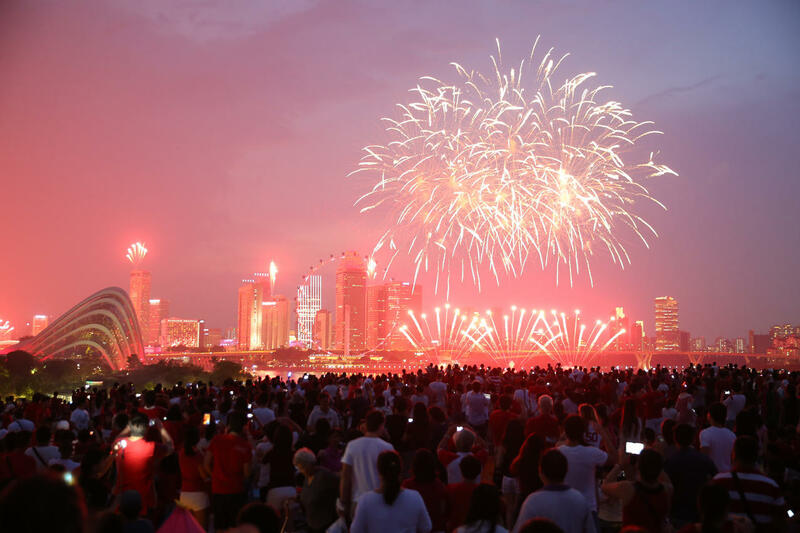 Independent Singapore turned 50 Sunday with fireworks, a massive military parade and a tribute to late founding leader Lee Kuan Yew. 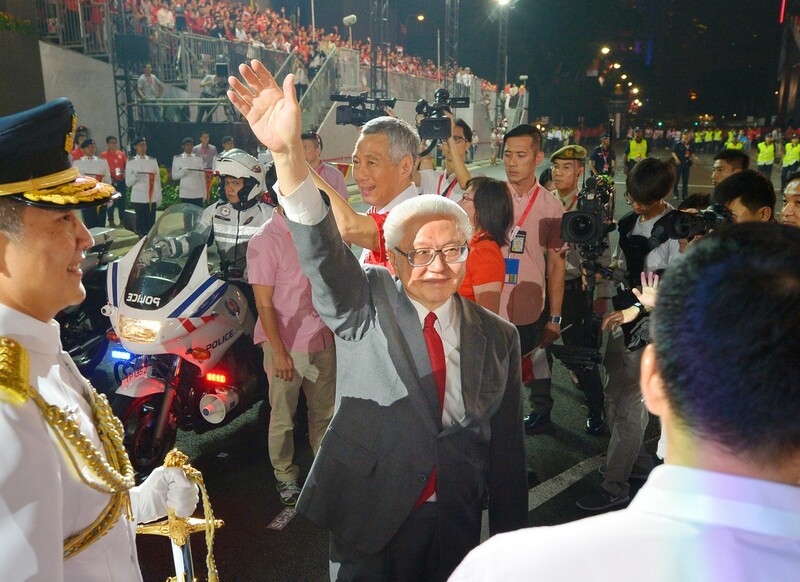 Lee, who died in March aged 91, was honoured with a video on his life and times at the beginning of the annual National Day Parade, the first he had ever missed. 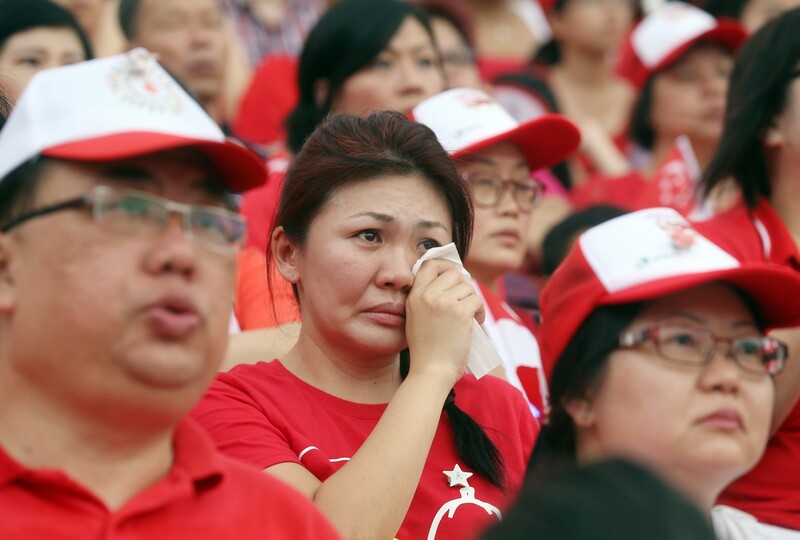 The crowd - decked in the red and white Singapore colours and many in tears - greeted the tribute with a robust round of applause. 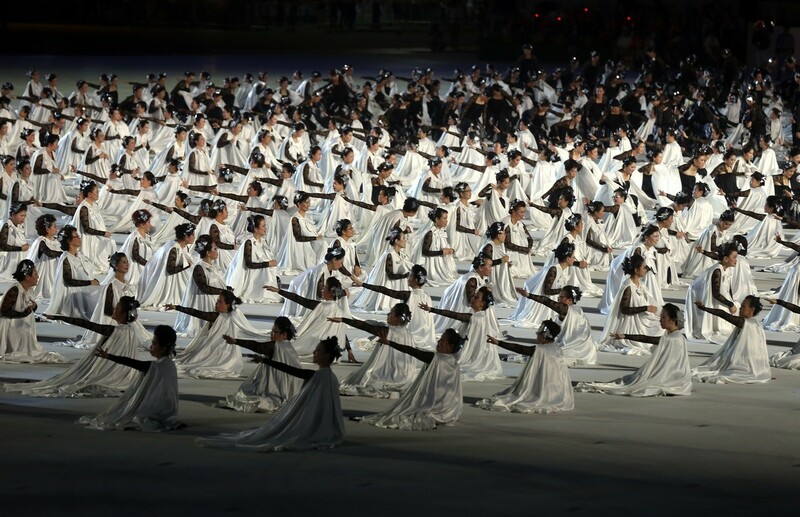 The festivities that followed featured about 2,000 marchers, 50 military aircraft, 177 tanks and other security hardware. 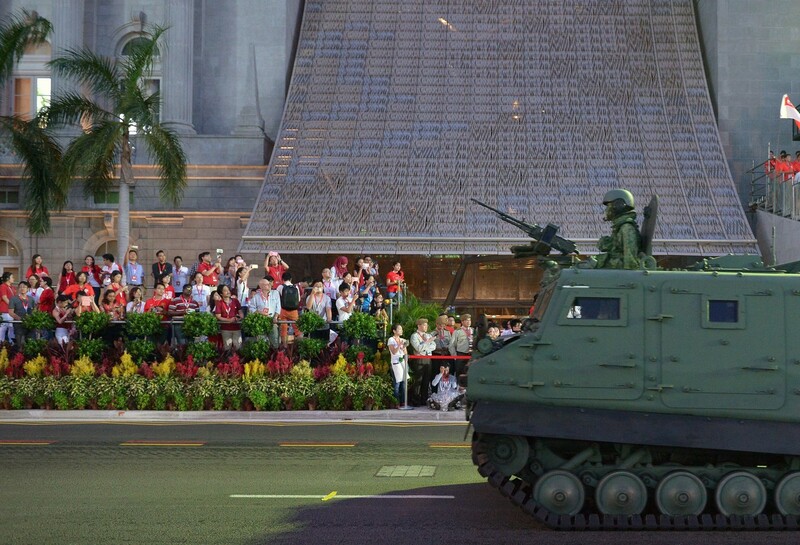 It underscored the Singapore military's status as the best armed in the region. 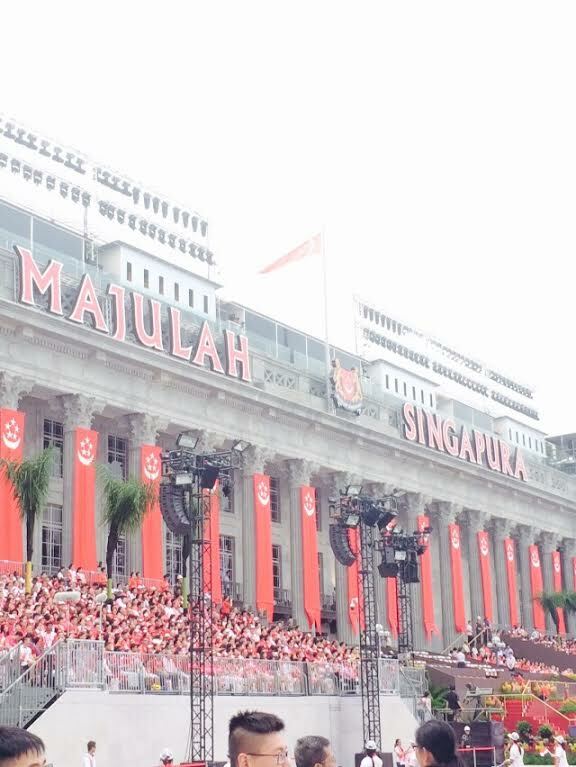 One of the highlights was a fly-past by a Singapore Airlines Airbus A380 superjumbo adorned with the republic's red-and-white flag featuring a crescent and four stars. 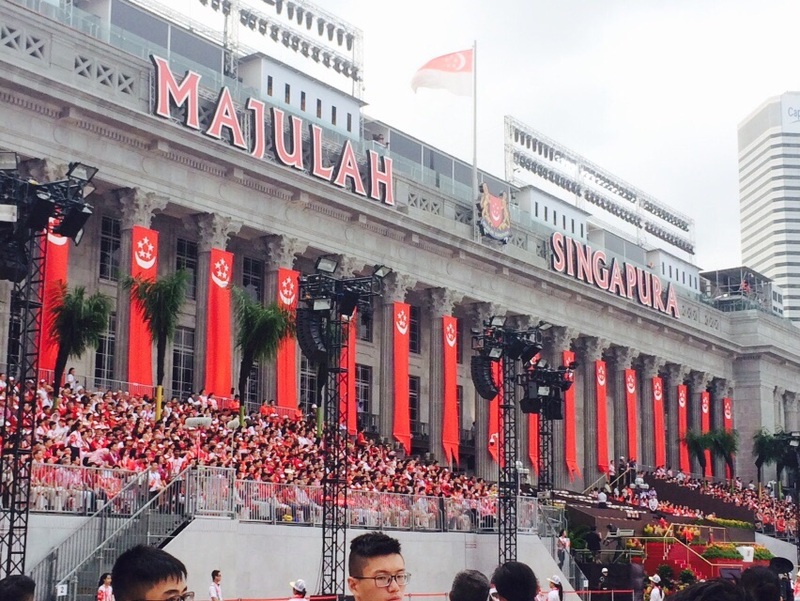 The crowd also cheered when 20 F-16 fighter jets formed the number "50" as they roared overhead. Minutes later, helicopters including Apache attack choppers flew by. 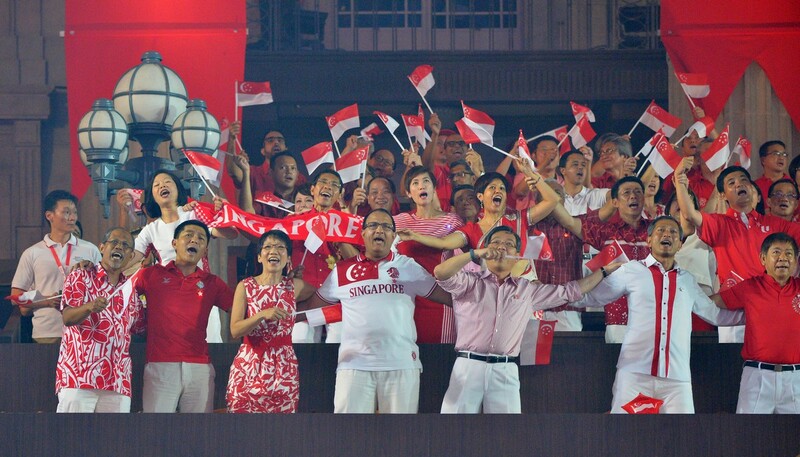 Stefanie Sun performing during NDP 2015. 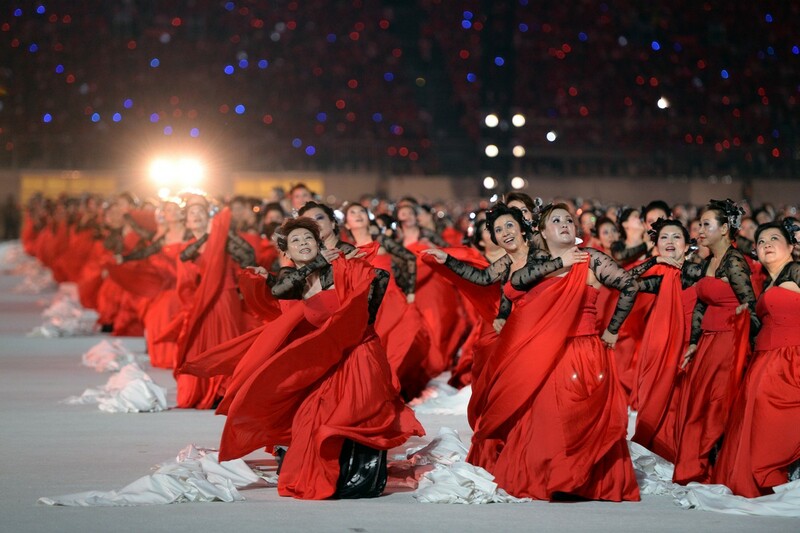 The procession was the high point of a jubilee year largely choreographed and funded by the government. 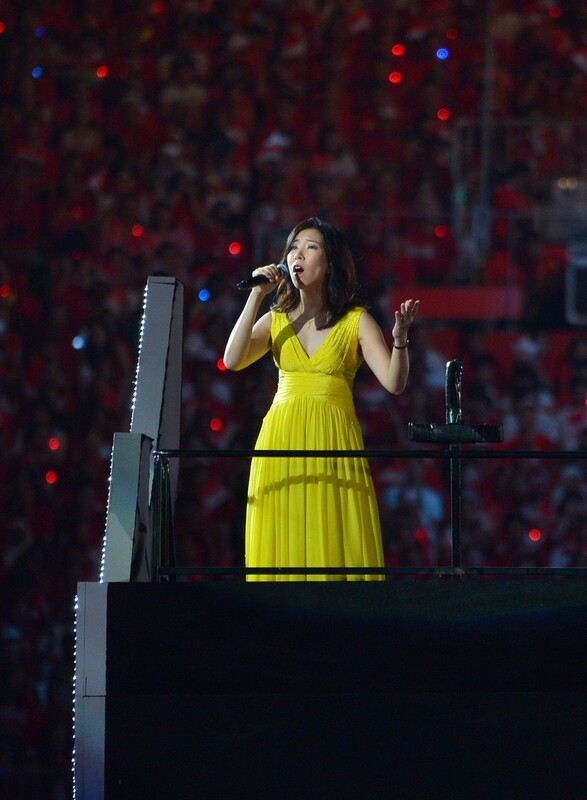 Singer Corrine May performed Song for Singapore. 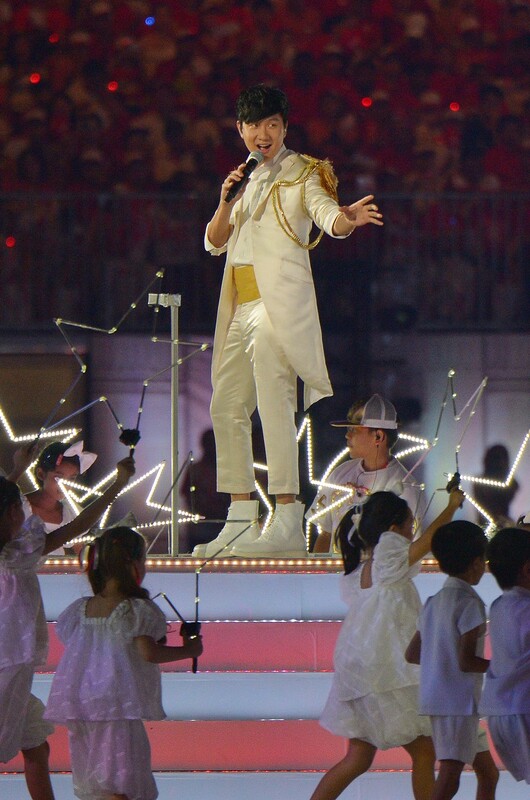 Singer JJ Lin sung the NDP 2015 theme song. 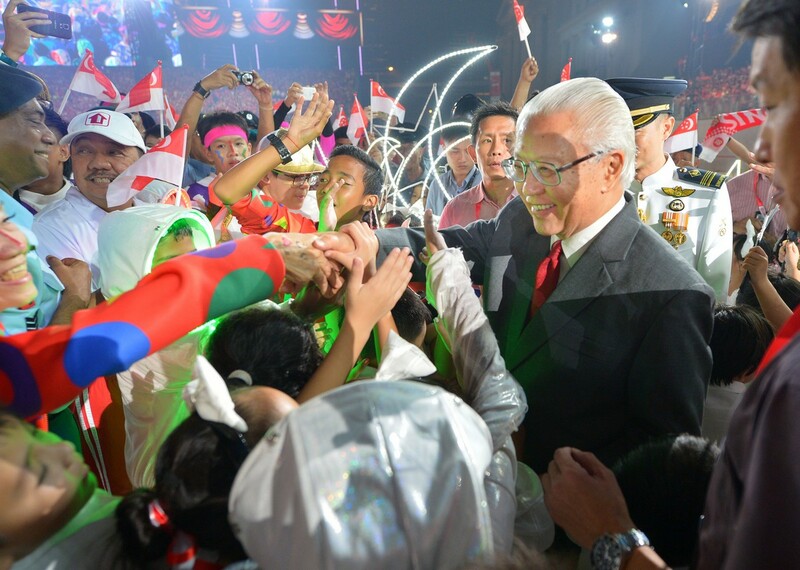 President Tony Tan mobbed by the crowd as he takes his leave. 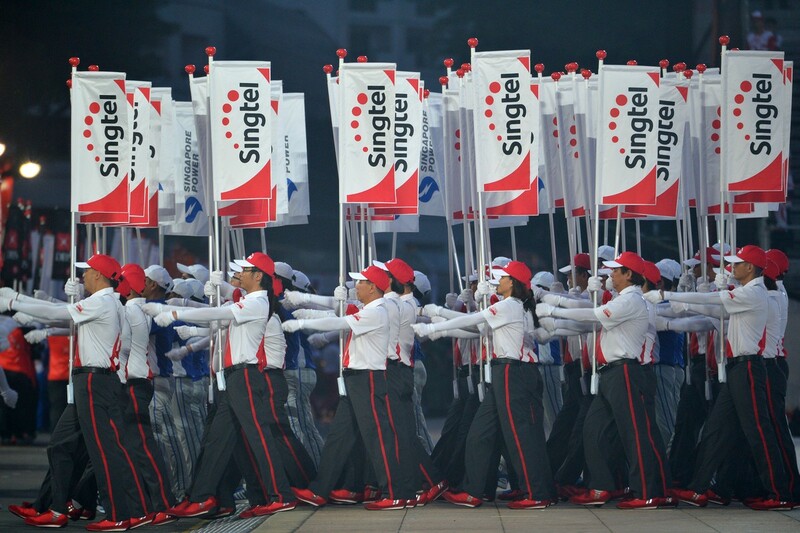 Around 250,000 spectators were predicted to watch the celebrations centred on the historic Padang waterfront district. 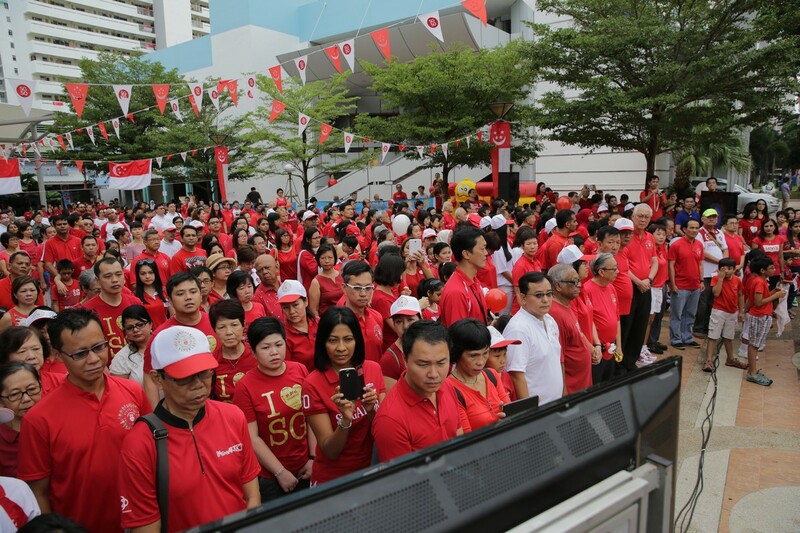 Thousands more at home followed the live broadcast. 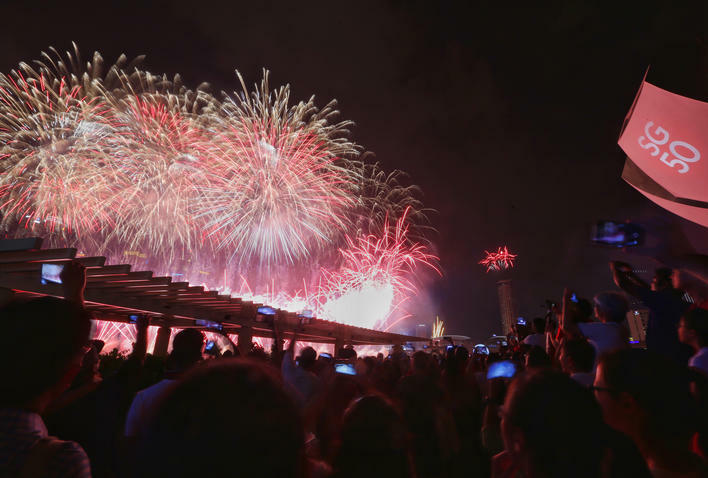 The celebration ended with a prolonged fireworks display. 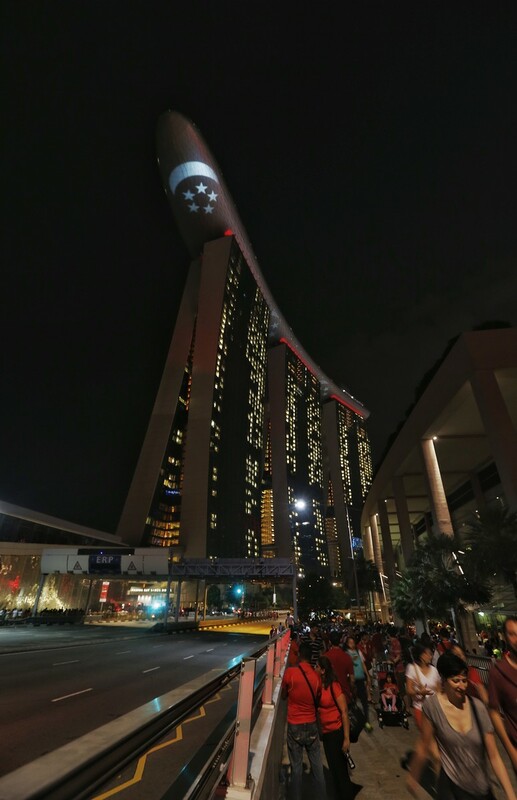 The crowd outside Marina Bay Sands watching the fireworks display. 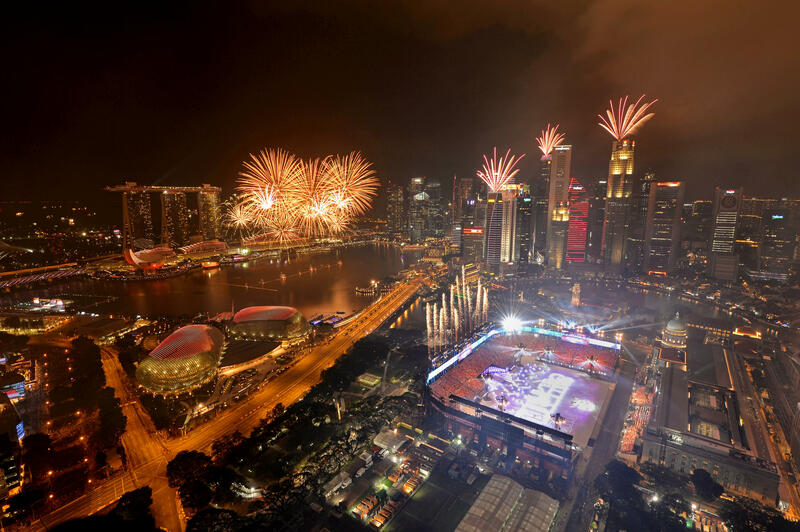 The NDP fireworks as seen from Marina Barrage. 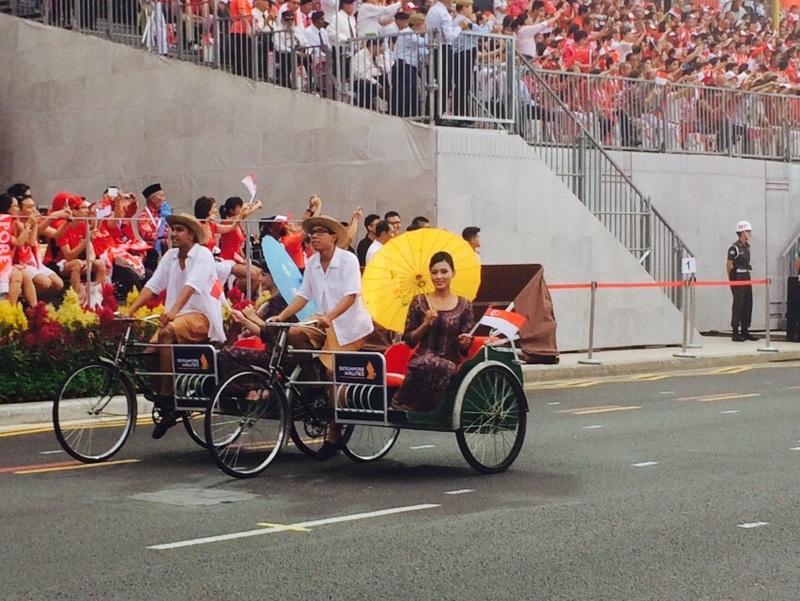 Singer Kit Chan performed the NDP classic "Home" for the finale of this year's parade. 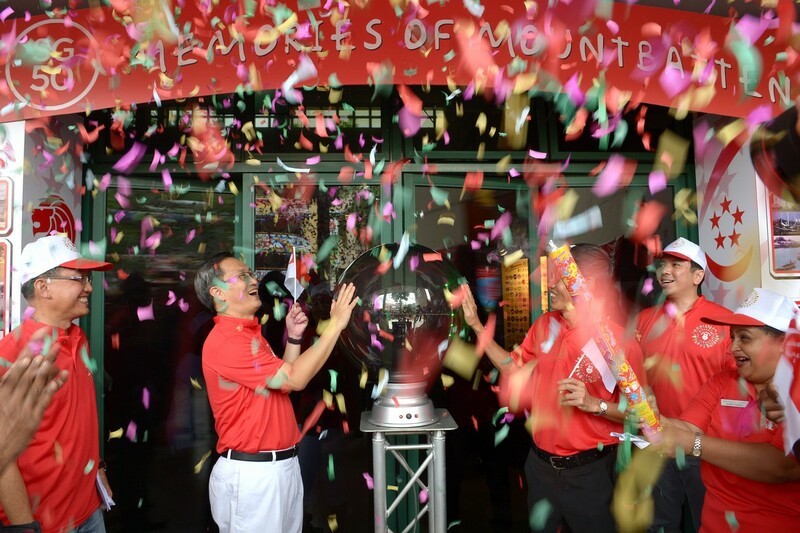 Leaders and top officials of the Association of Southeast Asian Nations along with officials from China, Australia and Japan, also attended the celebration. 20 F-16s roar past in an aerial display, forming the number 50. 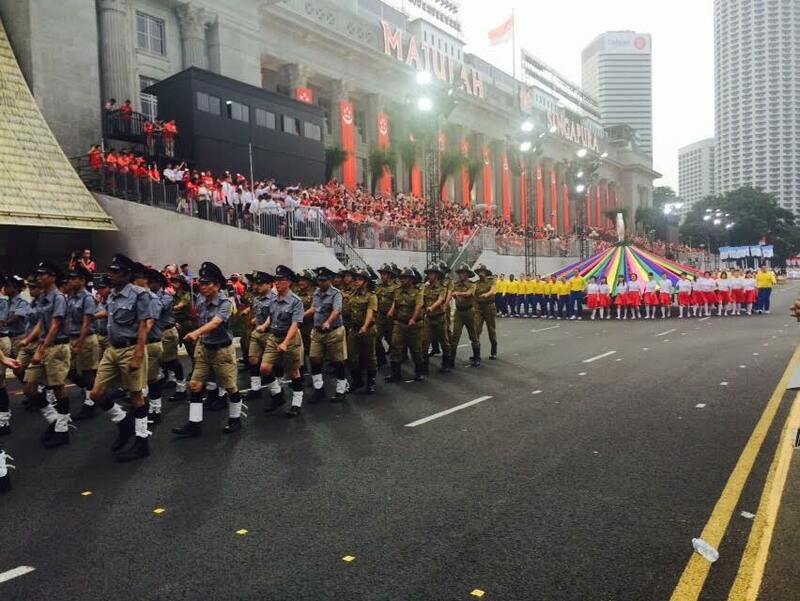 The mobile column at NDP 2015. 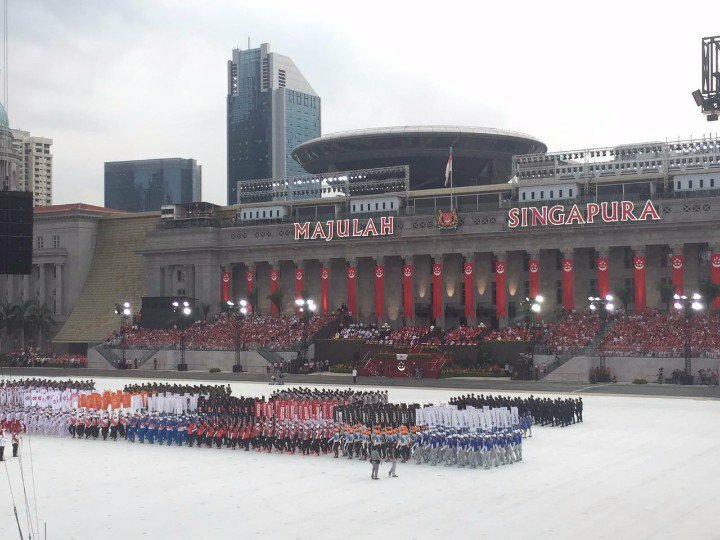 The National Day Parade (NDP) 2015, in celebration of Singapore's 50th anniversary of independence, kicked off at about 5.40pm with a rendition of classic NDP song Home by local band The Sam Willows. 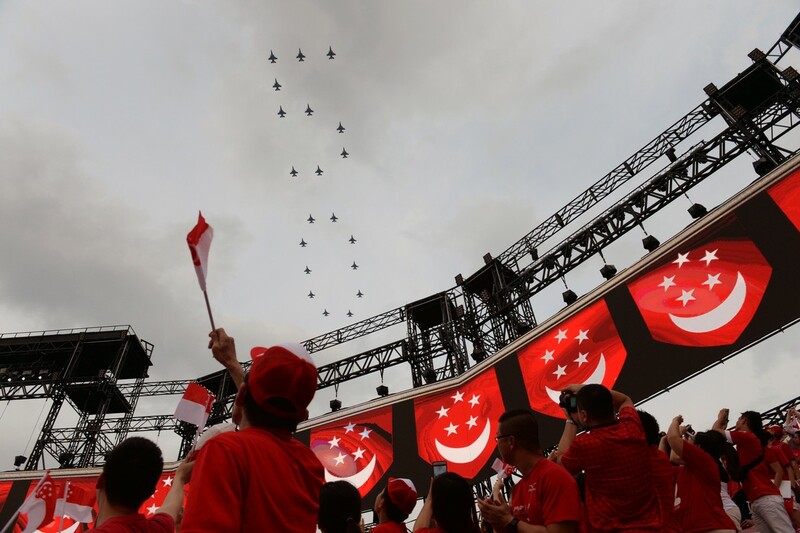 However, there was bad news when it was announced that the Singapore Armed Forces Red Lions would not be able to parachute due to bad weather conditions. 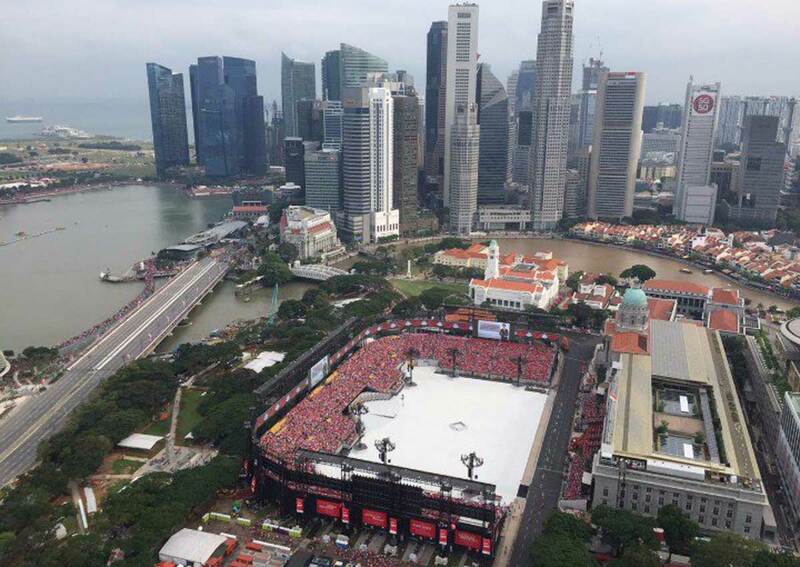 About 26,000 people filled the Padang for NDP 2015. 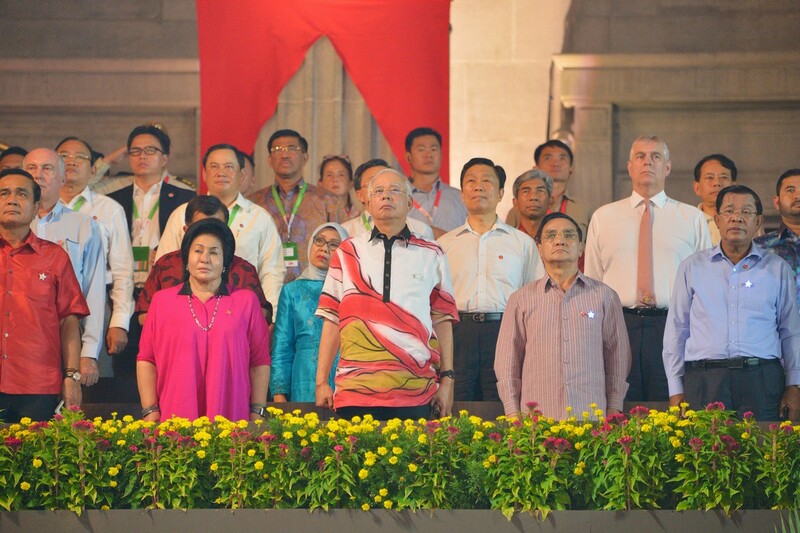 Various foreign leaders and dignitaries also attended the parade, including Malaysian Prime Minister Najib Razak, Sultan of Johor, Sultan Ibrahim Sultan Iskandar, and Sultan of Brunei, Sultan Hassanal Bolkiah. 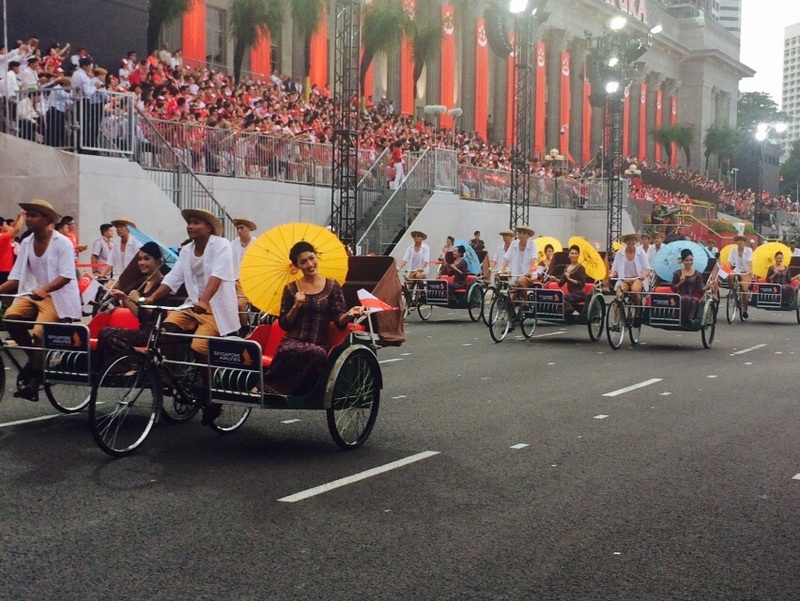 The vintage parade at NDP 2015. 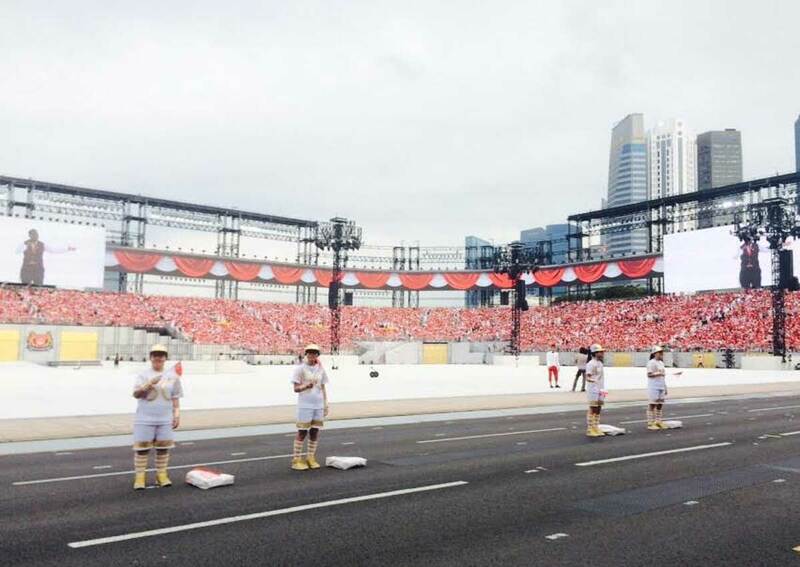 The Singapore Girls in trishaws on the ground are followed by SQ's A380 decked out in SG50 livery zooming past in the sky. The combined helicopter formation kick-starting the flypast with an arrowhead formation. This article was first published on Aug 10, 2015.